What caught my attention are those words, “The company has plans in case of a spill.” It is possible that Shell does have “plans.” Shell can indeed clean up a spill in the Arctic Ocean, if and only if they employ top magicians, and also top public relations firms—Exxon did that for the Valdez spill in Alaska, and Union Carbide did that for the Bhopal kill in India. A June 25, 2010 Union of Concerned Scientists press release states that “the same PR firm that represented Exxon after the Valdez oil spill,” also represented “Union Carbide after the Bhopal chemical disaster.” Yes, magicians and PR people working together can clean any spill, anywhere, including in the harsh, frozen arctic seas. Let’s take a closer look at some of Shell’s illustrious record from past operations. In November 2007, on a photography assignment (The Arctic Oil Rush) from Vanity Fair, I visited Siberia with Robert Thompson, Iñupiat conservationist and board chair of Resisting Environmental Destruction on Indigenous Lands (REDOIL—one of the 13 nonprofits that Shell recently sued with a preemptive strike). There we spent time with two arctic indigenous communities—the Eveny reindeer herders and the Yukaghir hunters. Even though I didn’t visit Sakhalin then, I began to learn about Shell’s offshore drilling operation there, in Far Eastern Siberia. First, I’d note that the latitude of Sakhalin in the Sea of Okhotsk is about 51 degrees N, whereas, the latitude of Chukchi and Beaufort Seas of arctic Alaska is about 68 degrees N, and is above the Arctic Circle—far harsher environment than Sakhalin. On September 14, 2011 Carole Holley of the Pacific Environment had sent me a package of information about Shell’s Sakhalin operation. (Pacific Environment is also one of those 13 nonprofits that Shell recently sued.) Over the past decade, Pacific Environment has worked closely with Sakhalin Environment Watch, a leading Russian environmental organization. In April 2011, SEW Executive Director Dmitry Lisitsyn received the prestigious Goldman Environmental Prize “in recognition of his decades–long struggle to defend Sakhalin Island from onshore and offshore oil and gas projects.” And in September 2011 they had a conservation victory. Here are some stories I found interesting from Carole’s documents that I’ll share with you. Let us return to the recent Los Angeles Times article, “Shell oil rig set for landmark Alaska journey.” If indeed, President Obama grants the few remaining permits to Shell, which most likely he will, and Shell starts exploratory drilling in the Beaufort and Chukchi Seas come July—Shell will “BP the Arctic” and destroy the rich marine environment there and the millennia old way of life of the indigenous Iñupiat communities. 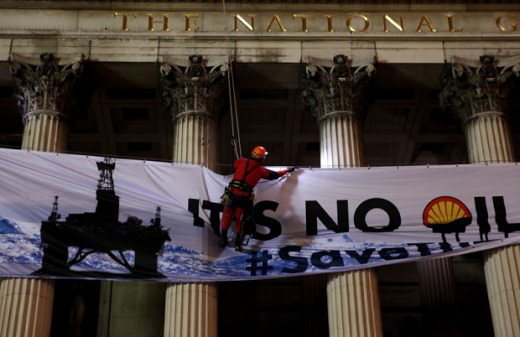 If you care about the arctic, and want to stop Shell from going there, first, stop hoping that Obama will do something. He won’t. His administration has been rubber–stamping Shell’s permits without an Environmental Impact Statement and without thorough review. And, his administration has been ignoring what the Iñupiat communities and the environmental organizations have to say about Shell’s arctic drilling plan. Instead, if you really want to protect the arctic, I’d suggest get out on the streets like the indigenous people of Sakhalin Island did; and most certainly do bold, creative and outrageous peaceful acts all across the country like the Greenpeace pranksters did at the National Gallery in London—that caused indigestion, but might also save the arctic. Note for readers: I’d like to thank Carole Holley of Pacific Environment for her assistance with this story.